The Hieromartyr Cornelius of the Pskov Caves was born in the year 1501 at Pskov into the noble family of Stephen and Maria. In order to give their son an education, his parents sent him to the Pskov Mirozh monastery, where he worked under the guidance of an Elder. He made candles, chopped wood, studied his letters, transcribed and adorned books, and also painted icons. Having finished his studies, Cornelius returned to his parental home with the resolve to become a monk. Once, the government clerk Misiur Munekhin took Cornelius with him to the Pskov Caves Monastery in the woods, which then was in the worst condition of any church in Pskov. The beauty of nature, and the solemnity of services in the cave church produced such a strong impression on Cornelius that he left his parental home forever and received monastic tonsure at the Pskov Caves Monastery. In 1529, at the age of twenty-eight, Saint Cornelius was made abbot and became head of the monastery. While he was igumen, the Pskov Caves Monastery reached its prime. The number of brethren increased from 15 to 200 men. This number of monks was not surpassed under any subsequent head of the monastery. The activity of Saint Cornelius extended far beyond the bounds of the monastery. He spread Orthodoxy among the Esti [Aesti]) and Saeti people living around the monastery, he built churches, hospices, homes for orphans and those in need. During a terrible plague in the Pskov region Saint Cornelius walked through the plague-infested villages to give Communion to the living and to sing burial services for the dead. During the Livonian war Saint Cornelius preached Christianity in the occupied cities, built churches, and distributed generous aid from the monastery storerooms to the Esti and Livonians suffering from the war. At the monastery he selflessly doctored and fed the injured and the maimed, preserved the dead in the caves, and inscribed their names in the monastery Synodikon for eternal remembrance. In the year 1560, on the Feast of the Dormition of the Mother of God, Saint Cornelius sent a prosphora and holy water as blessing for the Russian armies besieging the city of Thellin. On that very day the Germans surrendered the city. In 1570 when a See was established in Livonian Yuriev, a certain igumen Cornelius was appointed as Bishop of Yuriev and Velyansk (i.e., Thellin). Some have identified him with Saint Cornelius, but this does not correspond with actual events. Saint Cornelius was a great lover of books, and at the monastery there was quite a collection of books. In 1531 his work titled, “An Account of the Origin of the Pechersk Monastery” appeared. In the mid-sixteenth century the Pskov Caves Monastery took over the tradition of writing chronicles from the Spaso-Eleaszar Monastery. 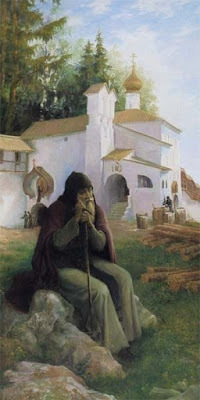 Saint Cornelius expanded and beautified the monastery, he further enlarged the monastery caves, he moved the wooden church of the Forty Martyrs of Sebaste beyond the monastery enclosure to the monastery gate, and on its site he built a church in the name of the Annunciation of the Most Holy Theotokos in the year 1541. 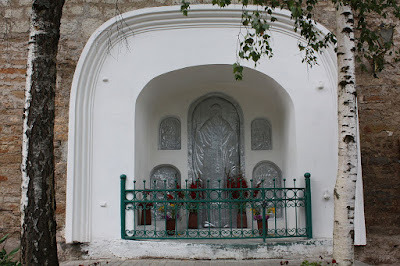 In 1559, he constructed a church dedicated to the Protection of the Most Holy Theotokos. The Caves Monastery, on the frontier of the Russian state, was not only a beacon of Orthodoxy, but also a bulwark against the external enemies of Russia. 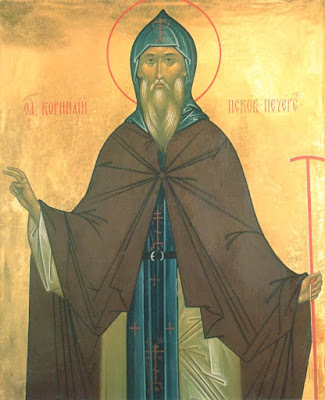 In the chronicle compiled by the hierodeacon Pitirim, the martyric death of Saint Cornelius was recorded: “This blessed Abbot Cornelius ... was abbot forty-one years and two months. 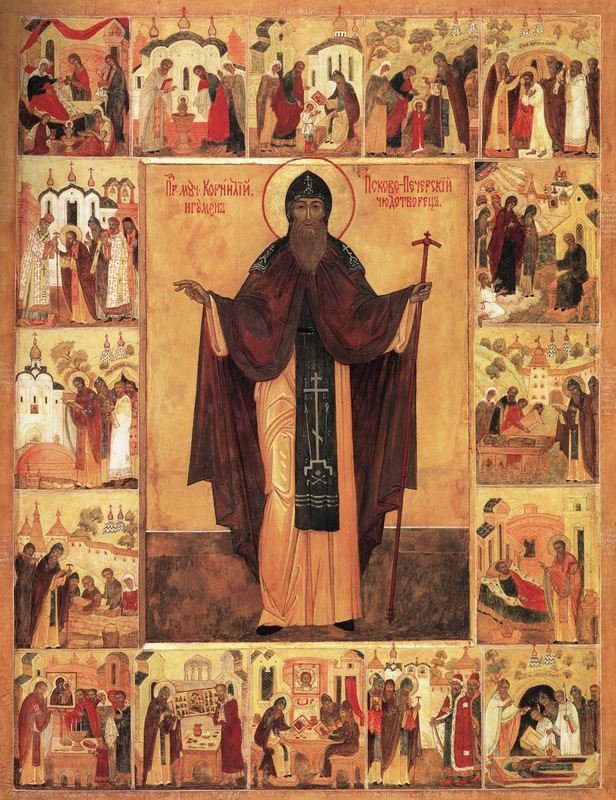 Not only as a monk, but also by his fasting and holy life, he was an image of salvation ... in these times there was much unrest in the Russian land. Finally, the earthly Tsar (Ivan the Terrible) sent him from this corruptible life to the Heavenly King in the eternal habitations, on February 20, 1570, in his 69th year.” (This information is on a ceramic plate, from the ceramics covering the mouth of the tomb of Saint Cornelius). In the ancient manuscripts of the Trinity-Sergiev Lavra it was written that Abbot Cornelius came out from the monastery gates with a cross to meet the Tsar. Ivan the Terrible, angered by a false slander, beheaded him with his own hands, but then immediately repented of his deed, and carried the body to the monastery. The pathway made scarlet by the blood of Saint Cornelius, along which the Tsar carried his body to the Dormition church, became known as the “Bloody Path.” Evidence of the Tsar’s repentance was the generous recompense he made to the Pskov Caves Monastery after the death of Saint Cornelius. The name of the igumen Cornelius was inscribed in the Tsar’s Synodikon. The body of Saint Cornelius was set into the wall of “the cave formed by God,” where it remained for 120 years without corruption. 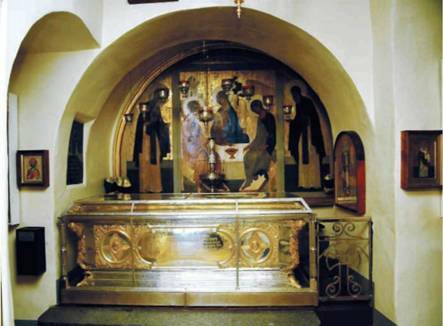 In the year 1690, Metropolitan Marcellus of Pskov and Izborsk, had the relics transferred from the cave to the Dormition cathedral church and placed in a new crypt in the wall. On December 17, 1872 the relics of Saint Cornelius were transferred from the former tomb into a copper-silver reliquary. They were placed into a new reliquary in 1892. It is presumed that the service to the martyr was composed for the Uncovering of the Relics in the year 1690.